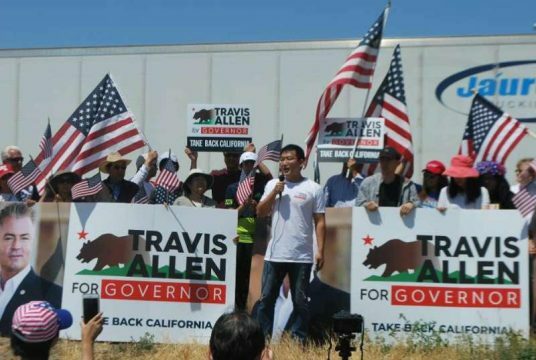 About 50 southern California local residents and Chinese American, supporters of Allen Travis for governor, gathered at memorial day morning at Chino airport to show their endorsement to Allen Travis. 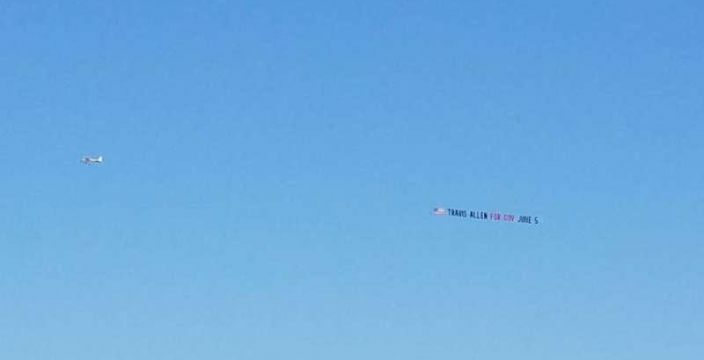 They also rent flying banner to marketing Allen Travis campaign . The United States of America is the shining star which attracts immigrants all over the world, including us—-Chinese Americans. We, the Chinese Americans, people who love peace, cross the Pacific Ocean to this country, for one reason: the American dream. We believe that America is a country with liberty and justice for all, we believe that all the citizens are treated equally here, we believe that we could get anything done and we could be someone when we work hard, we believe that our children could get the best education in the world, we believe that when we come to America, we would enjoy our new lives with the democracy, freedom, opportunities and endless hope. So we work extremely hard to make our dream come true. We take more than 5 years to legally get green cards and another 5 years to become citizens, we feel it is worthy of the wait because we love this country and respect the laws. However, the democratic politicians say NO to our dream. Our tax increases every year but our community is getting worse and worse every year. Criminals break into our homes and our cars because the Pro 47, Pro 57 are protecting them. Our children are confused about genders because of crooked books and liberal teachers. Illegal alien murderers were set free after killing a beautiful young American girl. Gas is much more expensive than all the other states but we have the worst roads. Where did the money go? We are so tired of all the lying democratic officials. Enough is enough, Chinese Americans are silent no more! Chinese Americans all over California donated the airplane banner out of their paychecks to support Travis Allen, because he is the only candidate who listens to the people. He is the only candidate who promises to fix problems for the people, he is the only candidate that people could trust because only by HIS agenda, only his agenda, we could take California back. After all that is done, California will be great again!